BEIJING — Chinese planes and ships held war games in the Sea of Japan last week, the military said, during which Beijing displayed its latest-generation frigate at a time of bitter territorial disputes with Asian neighbors. The Defense Ministry said in a statement on its website late Saturday that the long-range exercises staged Friday pitted a red army against a blue one in a simulated bomber attack on a naval task force. It quoted the commander of an unidentified flight wing under the East Sea Fleet, Zhang Wenzhong, as saying the planes found, identified and struck their targets in a "radically short time." The statement made no mention of what sort of conflict the exercise was intended as a response to, prospective foes or why the Sea of Japan was chosen as the location of the drills. However, China has grown increasingly assertive over its claim to a chain of uninhabited islands controlled by Japan, recently dispatching more than a dozen coast guard vessels as Chinese fishing vessels swarmed the surrounding waters. The ministry said the main ships involved in the exercise were the Jingzhou, a latest-generation type 054A class stealth frigate of which China is planning to deploy more than two dozen, and the type 052C destroyer Xi'an. The ministry said aircraft were guided to their targets with the aid of early warning planes. Other types of aircraft involved weren't identified, although China has been touting the capabilities of its latest-generation long-range H-6K strategic bomber equipped with the DH-20 land-attack cruise missile, giving it the ability to hit targets as far away as Australia. Only Russia and the U.S. are currently able to launch cruise missiles from the air. Along with its island dispute with Japan, China is involved in an intense rivalry with the U.S. over military dominance in the region. 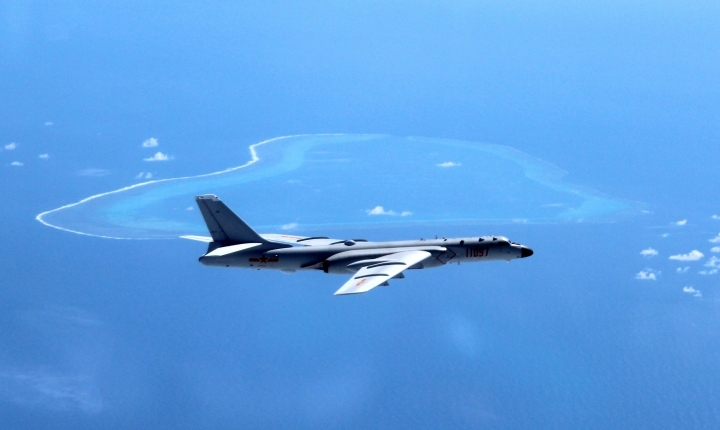 Tensions in the South China Sea have also risen after China refused to accept an international arbitration panel's ruling invalidating its claim to virtually the entire strategic water body. China plans joint naval exercises with Russia in the South China Sea next month, a move criticized by the head of the U.S. Pacific fleet as increasing instability in the region.